SIZE: 8"x10" paper with a white border for easy framing/matting. It will easily slide into a standard 8 x 10" frame or matte. 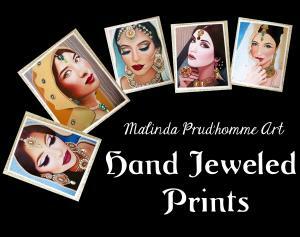 SPECIFICS: These prints are reproduced from original paintings by Mixed Media Artist Malinda Prud’homme. 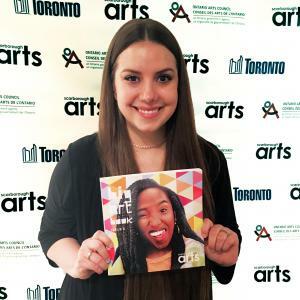 They are printed in-studio on Supreme Satin photo paper which has a lovely weight, a flawless velvety smooth surface, is tear resistant, curl resistant, and fade resistant. The artist will adhere real acrylic gems to the print by hand. She will choose in the moment what gems to apply as the print is not completely covered. While she will NOT be copying the gem patterns exactly as seen in these images, she will stay true to the amount of gems portrayed. Prices will vary based on the amount and colour of gems. Every portrait comes with either the colours shown in the photos, all crystals, or crystals and aurora borealis (multicoloured shimmer - AB) crystals. You can make your selections using the drop down lists. All prints are signed by the artist at the bottom of the print. SHIPPING: The print will be sent in a 100% recycled hard cardboard Mailer. Please remember that this image is copyrighted & not to be reproduced for any purposes without permission from Malinda Prud’homme. Purchase of this print does not transfer any image rights. 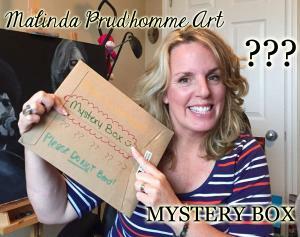 The lovely Stephanie Walsh purchased a $35 Malinda Prud'homme Art Mystery Box and, like the awesome gal she is, video taped the process so I could share it with all of you! "I decided it would be fun to get a mystery box from one of my favourite artists Malinda Prudhomme, so I did! I was really excited to open the box and see what goodies were inside! Malinda had taken the time to individually wrap each and every piece which added to the fun! The value of the mystery box far exceeded it's $35.00 purchase price!! Among the several items was a gorgeous print of one of her incredible beauties as well as a piece of her custom jewelry! I had a ball playing Malinda! Such a fun experience!! Thank you for sharing your beauties with the world!! 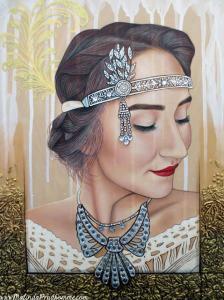 Kindest regards, Stephanie Walsh"
"Restless Mind ~ Beautiful Spirit"
This stunning portrait painting on a bamboo board is actually a revival and re-imagination of one of my older styles. 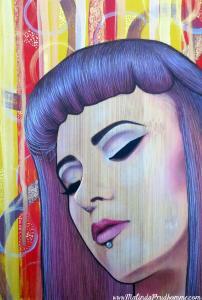 Back in 2012 I created a series on bamboo board entitled "Restless In Wonderment". Two of the three pieces were damaged in a storm during an outdoor art show but the most beloved one remained perfectly intact. Over the years it was published in magazines and was even on a cover! But for some reason it never sold. Then during my Solo Exhibition in November 2016 it sold TWICE. A gentleman from out of town purchased it at the gallery as a gift for his niece's wedding; while I had taken a payment from a long time supporters father. It turned out the daughter had always loved the piece. I decided to create her one from scratch using my new techniques and skills. The piece depicts her as one of my Restless Beauties, being filled with an abundance of thoughts. I wanted the painting to exude a calm beauty while expressing her restless mind using colour and design in the background. It's our thoughts and our feelings that makes us the truly beautiful and unique beings we are. HUGE EXCITING NEWS!!! I'M GOING TO BE ON TV!!! Last year Apartment 11 Productions asked me to be their portrait specialist for their TVOKids television series The Mystery Files! How crazily amazing is that? Out of all the incredible Canadian portrait artists ... they chose me. I can't even begin to describe how overwhelming and touching that is. It was last September when out of the blue I received a call from Ariel at Apartment 11 Productions asking if I'd be interested in being in an episode. I was floored. He went on to tell me that he had searched for the right candidate online and after a short while of watching a few artists' online presence, he knew I was the perfect candidate. 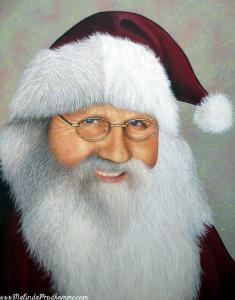 He saw me as a highly talented portrait artist with a good heart and a good message; a good role model for children. Still to this day those words touch me. Soon I was speaking with their writer Claire and come November we were shooting the episode right in my neighborhood at the Gladstone Hotel where I had set up a rental studio. Everything was very surreal. I still can't believe it. I'm definitely no actor and I'm terrible at remembering details, never mind lines! But the director, Kyla (one of the stars), and the whole filming crew were beyond kind and helpful. Very patient, very easy going, and super encouraging. They made me feel like I belonged there. I will cherish those memories forever. I've waited all this time for the episode to air and it has finally come. This is a BIG MOMENT for me! I would love to share it with as many of you as I can. 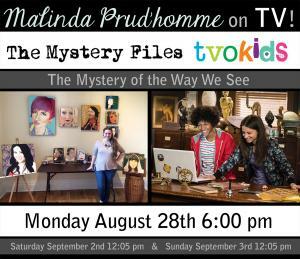 Please join in the excitement and watch my episode "The Mystery Of The Way We See". 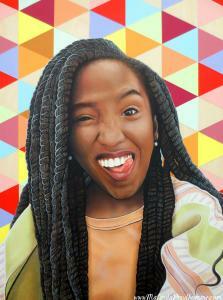 Kyla and I talk about the history of portraiture while we create portraits of each other! Grab all those beautiful babies of yours, furbabies, or just your beautiful self, and tune in to TVO Kids on Monday August 28th at 6PM! Don't forget to set your PVR! Having painted and become friends with her sister, it was only natural that Janique St Laurent and I would become a part of each others online circle. What a blessing that was because she would soon post a picture that would inspire one of the most delicate, beautiful, and unique pieces I have ever created. In her photo she wore a lovely 1920s inspired headband and I couldn’t help but feel this gorgeous old soul with a passion for social justice embodied the spirit of the roaring era. With that in mind I decide to capture her beauty somewhat translucently to convey that this 20s spirit is being reborn into our modern world. A particularly special aspect of the piece is a sculpted antique frame that, like the portrait, seems solid but then becomes ghostly. Lastly the gems in the jewelry give the piece a dream-like sparkle. I’m an avid history lover, and the 1920s is one of my favourite eras, so creating this piece truly touched my soul.